Today I am going to celebrate. This post is my 100th one! I started my blog more than one year ago, but I really started to blog in November last year. And now I have 100 posts and you are so nice that sometimes you read them, you take a look at the shots and you like my work. Big thanks to all of you. I really appreciate that I found brave followers, this post is shared with 629 of you and I am very happy for it. To celebrate this moment I am opening my new blog: Fototoulky s Kateřinou, which is in Czech language, mainly about pictures from places I love. As the summer season is resembling, I know my blog activities will slow down a bit, as I won’t be much on internet and by the PC to be able to write that often. On the other hand I will try to make more pictures to share them with you when business slow down again :-). What is difficult for me is that I won’t be able to follow the brilliant blogs you write that often and I am afraid that I will miss your posts, but that’s the life. It’s time to thank to bloggers who nominated me for nice awards. 4. Nominate 15 bloggers for the award and link to them. Check out my nominations below. They inspire me and I hope they inspire you as well! During my blogging I also particiated in gorgeous Junsjazz online magazin, I know everyone knows Junsjazz, just in case you are new here, his blogs are perfect!! The next award I was nominated for is the Sisterhood of the World Bloggers from Travel Oops, check this brilliant and funny blog here. ▪ Provide a link and thanks to the bloggers who nominated you. ▪ Nominate 10 blogs that you find a joy to read. ▪ Provide links to the blogs and inform the recipients they have been nominated. ▪ Include the award logo within your post. Let me post some balancing history of my blog here. My blog was born in September 2011 with post about which way to go down from Prague castle. Before my blog was born I planned to have a www page about Prague, about my guiding services, but I was not able to start it, as I didn’t know how. Then I participated in Agile conference in Prague, I was there as a help and guide for speakers. After the tour one speaker and his friend they founded a wordpress and twitter accounts for me, so here I am. Therefore, I want to thank Chris Matts and JB for helping me to find this beautiful community and for their kick. I hope you are also lucky to read my posts and enjoy my shots. Big thanks belong also to my husband, who is checking my English. If you find a mistake, it’s because I posted without his help :-). I also received some award nominations, which was a big surprise for me and I really appreciate it a lot. First one was “One Lovely Blog” Award, the nomination I got from Xavi. Adventurous Blogger Award from Snigdha at her GETSETANDGO blog here. 1. In which country or region would you like your next adventure to be? I have many dreams and wishes, but for now I choose Dublin in Ireland. 2. Where would you recommend for an adventurous time? Definitelly Prague and its surroundings, like Český Krumlov, Olomouc, Kutná Hora and many others. 3. Most interesting culture: I am happy to find most of the cultures interesting, every single one has something to admire. 4. Favorite activity: Talking to people, drinking coffee and watching the life around. 7. Happiness is: all around me. 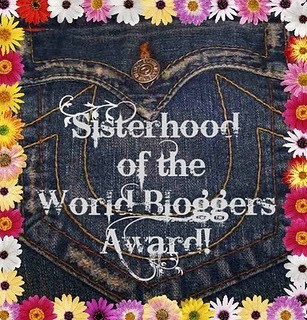 The nomination for Sisterhood of the World Bloggers Award! from Ana Ela at her HabitualRunaway blog here. Provide a link and thanks to the bloggers who nominated you. Nominate 10 blogs that you find a joy to read. Provide links to the blogs and inform the recipients they have been nominated. Include the award logo within your post. 1. Your favourite colour? Blue, pink, green. 2. Your favourite animal? Gorillas, small dogs and many many others. 3. Your favourite drink? Tea, coffee, fresh juice. 4. Facebook or Twitter? Both, as I can’t compare what is uncomparable for me. 5. Your favourite pattern? Any colorful pattern. 6. Do you prefer getting or giving presents? Giving and getting gifts that I like. 7. Your favourite number? 28. 8. Favourite day of the week? All of them. 9. Favourite flower? Gladiola, rose, meadow flowers. 10. What is your passion? Travel, photography. One more nomination came these days from Xavi here and I send him big thanks for this nomination for Liebster Blog. I like Xavi’s blog a lot and if you don’t know it, I encourage you to visit it. I’m glad and proud to accept the award. 4) Nominate 11 bloggers (and let them know I’ve done so). I am a tour guide here in Prague and around. I love looking at things as I see them for the first time. I love to share what I know with people. I love Prague and Czech Republic. I love looking out of the window when travelling. 10. What is the craziest thing you have ever seen or done? ? 1. If you could pick any holiday destination, where would you go and why? 3. What is favorite destination / place that you have visited and why? 4. Favourite thing to spend your time on? 5. What are your favourite books? 6. And your favourite movie? 7. Which place close to your home you would recommend us to visit? 10. What is the craziest thing you have ever seen or done? 11. What do you love about blogging? BIG THANKS to you all who are interested in my blog, who like it, comment it and subscribe it. First of all, I wanna really thanks to Xavi, from Xavigeis for nominate me to this award. I’m glad and proud you think with me and it’s an honour for me accept it. As it is, there are some rules that come with the award. I love travelling, I love making photos and then photo books from them, I love sharing knowledge with people, I love talking to people, I love making small designs so therefore I collect and design my own Pathtags (just for myslef at the timebeing), and as you maybe have noticed, I love Prague and showing it to other people :-).